NIMT edX is the online learning branch of the National Institute of Management and training which is basically a state of the art learning management system which employs technically advanced equipments to impart education and enhance the learning process of an individual. It is constructed on a strong foundation and has been specifically designed to cater to the problems faced by the students in the online education sector by keeping in the mind the loopholes and finding effective solutions to it. Through their online learning branch, the student does not feel isolated and the number of drop offs goes down. NIMT edX uses the course specific discussion methods to solve the lack of motivation problem and the students can come forward to pose their queries and look for solutions. They can also hold intellectually stimulating discussions with fellow classmates and teachers.The students can achieve real time reports of how their course is progressing which is shown in the form of bar charts. The students can thus map their progress on the assignments will be projected in the form of a bar chart where the X axis will portray the marks scored by an individual on their assignment. The discussion platforms are not only restricted to courses. Students can ask questions or initiate a discussion on any question or section in the course. The students can access this online classroom teaching session at any time and any place. The professors or mentors put together the demonstrations in the most interactive way possible which makes the learning process extremely engaging and the study material is quite informative too. 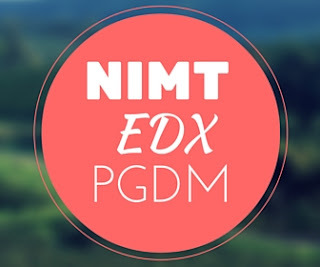 The Online education branch of NIMT, edX has collaborated with several schools and universities and has thus committed to foster excellence in the arena of teaching. Here are some of the PGDM courses in varied fields available for students. Post Graduate Diploma in Real Estate Management from NIMT, Greater Noida is a construction management course which is of two year duration and is a full time program.It is approved by AICTE, UGC and DEB and deals with the needs of the real estate industry. The student through this program can discover ways to steer through the market and industry lanes and help the real estate institution steer through the periods of industry change, examination of land valuation and market demand and management of projects across suppliers, capital sources and and suppliers. The course is distributed into four semesters of 6 month duration. Post Graduate Diploma in Hospital Management is a two year course which is offered full time NIMT, Greater Noida. The PGDM program is an AICTE, UGC and DEB approved program which focusses on the needs and intricacies of the healthcare sector. The healthcare industry is constantly climbing upwards on the path of progression and is expanding its wings in growth and evolution. The post graduate diploma in Hospital Management stands at an equivalent level with the MBA program and is essentially designed to provide the upcoming healthcare professionals with industry specific training in the health services, clinical information system management,health services administration and global healthcare management. This course was developed to fulfil the requirements of a professional management trainer who would supervise and govern the hospitals. The role was initially played by doctors and since there was an increasing distraction, the need for professional managers who are specifically trained for the job increased. The decision is even supported by the government who think public hospitals too need professionals for effective operation of the tasks and hence PGDM in Hospital Management is earning widespread popularity. Although there is a major bridge between the supply and demand of the healthcare managers and administrators who are willing to work for hospitals, health care insurance and third party administrators along with pharmaceutical companies. And, so the need of a professional manager having a PGDM degree has also increased. The course is split into four semesters of six months each and can be completed in a minimum of two years and a maximum of three years. This program offered by NIMT, Greater Noida is a two year full time course which essentially delves into the requirements of the Agri-Business Industry. The PGDM program in Agri-Business and Rural Management is specifically designed to help students gear up for careers pertaining to the food and agro-business sectors along with its allies. They are imparted training according to the international environment. The programme curriculum is specially prepared with intensive managerial foundations which provide an edge to this diploma over other agri-business programmes and thus makes this sector specific diploma really desirable. NIMT’s management culture and proficiency increase the overall benefits of the program which a focus on food and agri-business. The course curriculum lays down a solid foundation in management and also enhances the universal perspective of the students building on their skills. There are precisely three components which are the core management related courses, food and agri business related courses and courses which are elective. The program will increase the expertise and mould the professional leaders and entrepreneurs according to the food and agriculture business sector. There is a strict maintenance of rigorous intellectual process of teaching to craft and up-skill the students according to the International standards. The course is split into four semesters of six months each and each student can complete the course in a minimum of two year and a maximum of three year duration. Post Graduate Diploma in Pharma Management given by NIMT, Greater Noida is of 24 month duration and is full time. It is recognized by AICTE, UGC and DEB and caters to the requirements of the Pharmaceutical industry. PGDM in Pharma Management is specifically designed to educate the students regarding subjects pertaining to the industry like Pharmaceuticals, GMP, Brand Building, Physiology, New Project Launch, Pharma Marketing which includes all the major functions like Sales Force Management, Product Management etc. Along with this, other functions which are focused upon in this program are IPR, International Marketing, Drug Regulation and General Management. The course is distributed into four semesters and is of six months each. A student can complete the course in a minimum of two years and a maximum of three year duration.